Thrawn goes on to say that this “servant” “always spoke highly of Chancellor Palpatine,” which is a hint that they met before the Empire was officially created. Another big hint to that effect? The name of the servant was Anakin Skywalker. Not Darth Vader. So, at some point, Jedi knight Anakin Skywalker had an encounter with Thrawn and the Chiss (his alien race), told Thrawn all about Palpatine, and gave enough away that Thrawn—master of observation—figured out that Palpatine was making a servant out of Anakin. That’s... a lot packed into what was likely not a deep conversation. The other thing the excerpt reveals is that Zahn is keeping Thrawn’s original backstory intact. Over the course of many books in the old Star Wars Expanded Universe, Zahn established that the Chiss, were aware of threats from outside the known galaxy. He’d also established that Thrawn had been exiled by the Chiss for acting against their principal of never engaging in a pre-emptive strike. 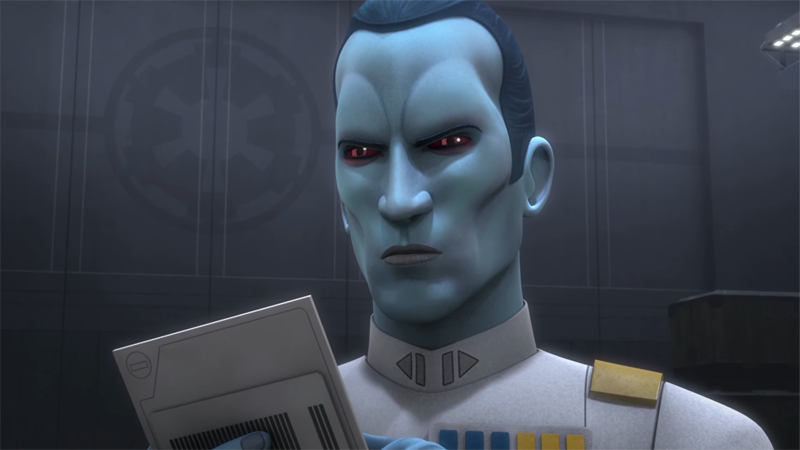 And yet, Thrawn saw his exile and Imperial service as a way to protect his people against the dangers from beyond. The excerpt has Thrawn talk about dangers in the Unknown Regions, which Palpatine says he’s going to investigate himself. In Aftermath: Empire’s End, we learned that Palpatine was obsessed with exploring outside the known galaxy, so that fits. The excerpt reveals that, yes, like in the EU, Thrawn has been exiled. And it also has him explaining that he doesn’t see serving the Empire and the Chiss as mutually exclusive goals. So he’s pretty much, in background at least, still the Thrawn we all know and love. I want this book to be out already.